LIENCRES, Spain (Friday, Sept. 7, 2007) â€“ 2004 ASP World Champion Sofia Mulanovich (PER) stepped up to the poduimâ€™s highest block at the Rip Curl Girls Festival in Liencres today, when she defeated Silvana Lima (BRA )to win Stop No. 4 of 7 on surfing’s elite ASP Womenâ€™s World Tour. An absolute standout in the left breaking waves of Liencres, Mulanovich positioned herself as the eventâ€™s top scorer, posting the only pair of 9-piont rides (out of a possible 10.00 points) in the earlier rounds, as well as a an excellent 8.50 against Lima in the final. In what proved to be a clash of fierce South American surfing, it was Lima who took an early lead in the 40-minute Final, her pair of seven-point rides leaving Mulanovich no choice but to reveal the depth of her surfing talent. The former ASP World Champion answered back with an 8.50 and 7.05. The victory was Mulanovichâ€™s first of 2007 and has bumped her up from World No. 6 to World No. 3 on the ASP Ratings. Her best result of 2007 going into this event was a second place finish to Stephanie Gilmore (AUS) at the Rip Curl Women’s Pro at Bells Beach in April. Limaâ€™s runner-up finish marks her second consecutive second place result this year and sees her move up into the World No. 2 spot. Leaving Spain, semifinalist Samantha Cornish (AUS) now holds the World No. 1 spot for the first time in her professional surfing career. Cornish finished equal third when she was ousted by Mulanovich in Semifinal 1. Cornish was awarded the ASP injury wildcard at the end of 2006 after nearly falling off the tour and has stamped her dominance on top tier surfing this year, with another outstanding performance at this event. Inspired by her traveling buddy Samantha Cornishâ€™s recent success in Brazil, Amee Donohoe (AUS) secured her best result in her first year back on the ASP Womenâ€™s World Tour, finishing equal third when she was defeated by Lima in Semifinal 2.
â€œI canâ€™t complain, it would have been nice to make the Final but this will improve my spot on the ratings and I just really want to stay on tour,â€ Donohoe said. Opening up with a 7.00 off her first wave, Donohoe was unable to find a back up score, allowing Lima a ticket into the Final with an 8.50 and a 5.50. Stephanie Gilmore (AUS), who was rated World No. 1 going into this event has lost her ratings lead, dropping to World No. 4 after a disappointing equal 9th place finish on Thursday. The Rip Curl Girls Festival saw three back-to-back days of action packed surfing from the Worldâ€™s Top 17 Women who competed in Spain for the first time in ASP Womenâ€™s World Tour history. The Rip Curl Girls Festival will be broadcast around the world via live webcast transmission online at www.ripcurl.com/girlsfestival. 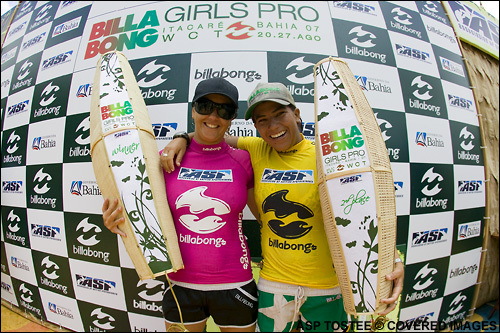 PRAIA DA TIRIRICA, Brazil (Saturday, Aug. 25, 2007) â€“ Rising out of a four-year shadow, 26-year-old Samantha Cornish (AUS) won her first ASP Womenâ€™s World Tour title since 2003, at the Billabong Girls Pro ItacarÃ©, this morning. Cornish defeated Brazilian sensation Silvana Lima (BRA) with 12.00 points (out of a possible 20.00) to Limaâ€™s 8.10, winning US$ 12,000 and simultaneously shooting to World No. 2 on the ASP Womenâ€™s World Tour ratings. After failing to requalify for the ASP Womenâ€™s World Tour at the end of 2006, Cornish was granted an injury wildcard back onto the tour in 2007, returning to competition visibly fit and focused as her result today proved. Entering the event as equal World No. 4, Cornish seized the worldâ€™s attention by breaking the ASP ratings lead deadlock between Stephanie Gilmore (AUS) and Chelsea Hedges (AUS), eliminating Hedges in the Quarterfinals on Friday and Gilmore in the Semifinals this morning. Runner-up Silvana Lima (BRA) did her nation proud by reaching her first ASP Womenâ€™s World Tour final today, earning US$ 7000 and maintaining her World No. 4 spot. The inspirational Brazilian talent defeated defending Billabong Girls Pro champion and 7X ASP World Champion Layne Beachley (AUS) in the Quarterfinals on Friday, capturing a narrow victory over Rebecca Woods (AUS) in the Semifinals this morning. Stephanie Gilmore (AUS) and Rebecca Woods (AUS) finished in equal 3rd overall, earning US$ 5000 each. Gilmore has maintained her World No. 1 spot which she now holds alone, for the first time in her rookie career. Woods was visibly disappointed after missing out on yet another Final and has slipped down one place to World No. 5. Despite losing the ASP ratings lead and slipping down to World No. 3 after finishing equal 5th on Friday, Hedges (AUS) walked away with US$ 2000 for winning both the Kustom Best Wave and Nixon Best Trick awards, for her spectacular surfing throughout the event. The final three heats of the Billabong Girls Pro ItacarÃ© were held in tricky 1-metre beach break waves. The ASP Womenâ€™s World Tour now moves to Spain for Stop No. 4 of 7, the Rip Curl Girls Festival in Santander. (Friday, Apr. 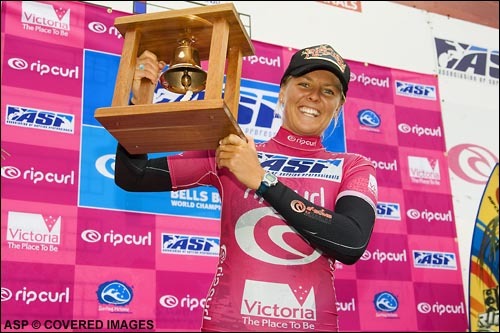 6, 2007) – ASP Womenâ€™s World Tour Rookie Stephanie Gilmore (AUS) is on top of the world after winning the Rip Curl Womenâ€™s Pro and her first victory as an elite tour surfer at Bells Beach today. Gilmoreâ€™s trouncing of defending Rip Curl Pro and 2004 World Champion Sofia Mulanovich (PER) in the Final has catapulted her to equal World No. 1 for the first time in her career. She shares the rating with 2005 World Champion Chelsea Hedges (AUS). Gilmore, who won two ASP Womenâ€™s World Tour events as a wildcard before qualifying for the 2007 elite tour, has been vocal about her aspirations to earn a world title her first year on tour. She was disappointed to start that campaign with an equal 5th finish after being eliminated by Hedges in the Quarterfinals on the Gold Coast of Australia last month. Her Quarterfinal win over Hedges today puts the surfers at two wins apiece in elite tour competition. Gilmore trailed Mulanovich for the first half of the Final, but left the Peruvian needing a perfect 10.00 after posting the highest wave score of the entire event, a 9.33, with six minutes to go. Mulanovich, who â€™rang the Bellâ€™ when the womenâ€™s event was last held at Bells Beach in 2005, moved from equal 17th to World No. 3 with the Rip Curl Pro runner-up finish. Mulanovichâ€™s final berth today was her first since 2005 when she won an ASP Womenâ€™s World Tour event in England. She was not a factor in last yearâ€™s world title race but is looking to be back in the mix in 2007. Mulanovich beat reigning world champion and three-time Rip Curl Pro at Bells Beach winner Layne Beachley (AUS) in the semifinals. Beachley won her seventh world title last year and has cited upcoming talent such as Gilmore as a major motivation for staying on tour. Samantha Cornish (AUS) also made a semifinal showing today but was easily eliminated by Gilmore in their wave-starved heat. The women will not surf another ASP Womenâ€™s World Tour event until August when they will head to Brazil. COOLANGATTA, Australia (Monday, Mar. 5, 2007) â€“ Chelsea Hedges, 23, has won the first event on the 2007 ASP Womenâ€™s World Tour, the Roxy Pro Gold Coast presented by Samsung, at what amounts to her home break of Snapper Rocks in Coolangatta, Australia today. Hedges (formerly Georgeson) moved to Coolangatta from Avoca Beach in Sydney two years ago and has moved to ASP World No. 1 with her win today. The 2005 ASP Womenâ€™s World Champion defeated prodigious Roxy Pro Wildcard Carissa Moore (HAW), 14, the youngest finalist in ASP elite-tour history, in three foot (one metre) waves this afternoon. Hedges has moved to World No. 1 with the win. Hedges had to overcome the worldâ€™s brightest up-and-coming talent to make the event final today. She defeated uber-rookie Stephanie Gilmore (AUS) in the Quarterfinals and second-year surfer Silvana Lima (BRA) in the Semifinal before meeting Moore. Moore, who after winning the Roxy Pro Trials was surfing in her first-ever ASP Womenâ€™s World Tour event, posted 9.33 single wave scores in her Round 3, Quarterfinal and Semifinal heats but only managed a 6.70 two-wave total in the final against Hedges. Honing her competitive edge in various trials and junior events, Moore took out seven-time ASP World Champion Layne Beachley (AUS), veteran competitor and former World No. 2 Megan Abubo (HAW) and 2005 ASP Rookie of the Year Rebecca Woods (AUS) en route to the final. Woods will leave Snapper Rocks sitting equal 2nd on the ASP Womenâ€™s World Tour ratings. Tying Woods with an equal Roxy Pr 5th was Brazilâ€™s Silvana Lima. Lima eliminated reigning Roxy Pro Gold Coast Champion, Melanie Redman-Carr (AUS), when she posted the highest single wave score (a 9.80 out of 10.00) and heat total (18.80 out of 20.00) of the event in the Quarters, but she was unable recreate that magic in her Semifinal against the eventual Roxy Pro winner. The next stop on the ASP Women’s World Tour is Bells Beach, Australia for the Rip Curl Pro. After a one-year hiatus from the elite-tour calendar, the historical venue will be back from Apr. 3-8, 2007. Visit the press room on www.aspworldtour.com for heat by heat updates, transcribed athlete interviews, audio files and complimentary high-res images. Roxy Pro Semifinal Results: 1st advances to Final, 2nd is eliminated. Roxy Pro Quarterfinal Results: 1st advances to Semifinals, 2nd is eliminated.